Produktinformationen "Bit:2:Pi BBC Micro:Bit adaptor for Raspberry Pi Addons"
The Bit:2:Pi enables you to re-use all those hundreds of Raspberry Pi addon boards and HATs. 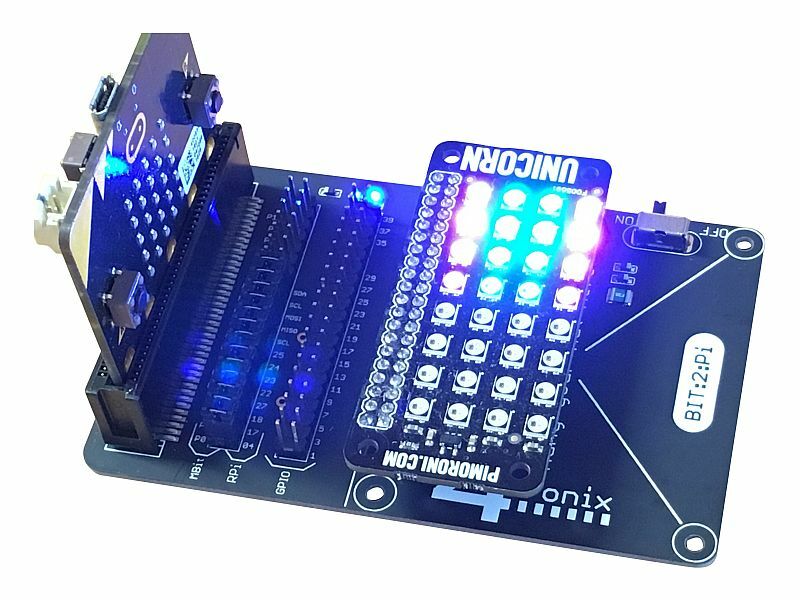 Simply plug your Micro:Bit into the edge connector and the required Raspberry Pi Hat onto the GPIO connector, then program your Micro:Bit to control the new board. Most Raspberry Pi boards are very simple to program as they are controlled by simple on/off signals on the GPIO connector which are easily copied in the Micro:Bit. We have also used Neopixel hats (eg. Unicorn from Pimoroni) with great success and are happily communicating via I2C as well. Selecting which Micro:Bit pin is connected to which GPIO pin, is via a set of configurable jumpers. There is a default set of connections that works for the most common boards, including I2C and SPI connections, but it is a simple matter to unplug a jumper or two, and replace it with a longer wire jumper (4 included) to connect your preferred pins. Of course, the original code for the Raspberry Pi won't run directly on the micro:bit but with support from our community we will get more and more boards working and with example microbit code. 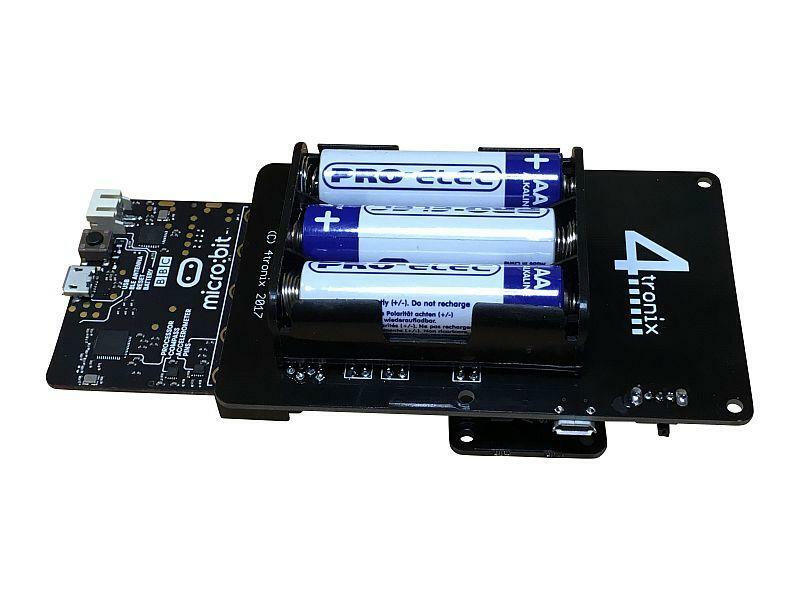 Power is supplied to the board and the micro:bit via the micro-USB connector on the side, but there is also an option to add a battery holder to allow completely wire-free operation. Weiterführende Links zu "Bit:2:Pi BBC Micro:Bit adaptor for Raspberry Pi Addons"
Garantie(Jahre) "Bit:2:Pi BBC Micro:Bit adaptor for Raspberry Pi Addons"
Weitere Info "Bit:2:Pi BBC Micro:Bit adaptor for Raspberry Pi Addons"
Kundenbewertungen für "Bit:2:Pi BBC Micro:Bit adaptor for Raspberry Pi Addons"